Many community groups in the early years of this century used a system called Commanet to scan and store their local history material. Commanet ceased to trade several years ago, with the result that the groups were using software which was no longer supported. CommunitySites were approached by several groups and developed an import routine from the Commanet database to retrieve the material and put it online using open-source software. As a result, with support from Cambridgeshire County Council, over thirty community archive groups from the Cambridgeshire Community Archive Network are still online. 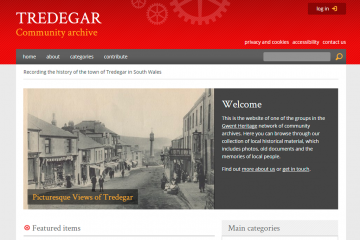 Gwent County Council also funded the migration of a group of Commanet archives in Wales at www.gwentcommunityheritage.org.uk. To commemorate the 1914-1918 Great War, many history projects around the UK are researching and publishing information about the First World War soldiers on local war memorials. CommunitySites have been importing the information that volunteers have recorded on spreadsheets and presenting it interactively online. 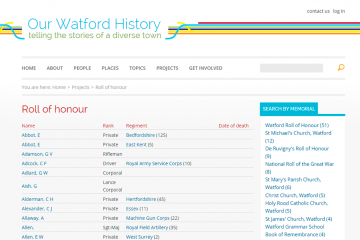 There are examples at Our Watford History and on the Bottesford History website. Similarly, for the Oughterard Heritage group in Ireland, we have uploaded a passenger list of the local emigrants who sailed from Ireland to Canada under the assisted emigration schemes initiated by the philanthropist, James Hack Tuke, between 1882 and 1884.